Despite the title of this article it turns out that there are no 'best' moments for self storage in the movies. It seems that self storage and storage facilities get mentioned an awful lot in the movies and on primetime TV dramas, but not in a particularly positive way! Self storage facilities have appeared in countless famous and well known cult TV shows and movies including; Breaking Bad (Skyler’s pile of cash got stored in a storage unit), True Detective, Citizen Kane (a brief mention of storage out west) and director Patty Jenkins dark, bleak, true story starring Charlize Theron as the female serial killer Aileen Wuernos in Monster who uses a storage facility to store her belongings . Here we have compiled the top 5 best and worst self storage movies of all time – and unsurprisingly they are all horror films. Directed by Matt Winn, this 2015 films stars Mischa Barton as Ella, who thinks her boyfriend is having an affair because he is ‘renting a secret storage unit!’ On the back of such ridiculously flimsy reasoning she gains access to the storage facility and then finds herself locked in with something menacing and terrible that is not a collection of special edition Star Wars Lego. This Australian movie (never a good sign) was filmed in Brisbane and features actor Matthew Scully as 17 year old ‘Jimmy,’ who is bereft and alone after the death of his father. Consumed by grief, he goes to live with his Uncle who just happens to run an underground (obviously) storage facility in the city – just the sort of place to go to work if you want to cheer yourself up. While exploring the maze of corridors Jimmy comes across a deeply disturbed man and all manner of terrifying moments ensue, including ‘the viewer’ wondering about what else they could have been doing instead of watching this dire rubbish. This 2013 film was set and shot in Rhode Island, USA and has the type of plot anyone thinking of producing a horror movie in a self-storage facility might write. Start with one leading character played by Eric Roberts (Jake), a the security guard at a storage facility who decides to have a party ‘after hours’ with a few friends. For some strange reason there are a number things under lock and key at the facility that should never be disturbed, which possibly should have included the plot line of this movie. Filmed in West London at a slightly tatty and run down storage facility, Storage 24 has one of the most ludicrous of plot lines of our top 5. Not only does a military plane crash into London leaving its highly classified contents strewn across the capital, but it was also carrying a highly dangerous alien. Needless to say the nasty alien ends up inside a 24 hour storage facility with a number of the customers and staff. As the alien gradually kills the customers, the survivors are torn between escape or leaving a scathing review of the facility on Feefo. This film only reached number 2 on our list because it’s set in London and the alien manages to disembowel and consume the majority of the cast, who deserve nothing better after such poor acting. After 4 terrible films set in their entirety in self storage facilities, we have our number 1 which features a brief, but forever classic movie scene set in a storage unit. It is dusk as Clarice Starling (Jodie Foster) finds herself crawling under the partially opened door to storage unit 31 at Your-Self Storage (great name) under the watchful eye of the facility manager. She is there because Dr. Hannibal Lecter has given her a tip-off in her investigation. The well packed storage unit has been paid for upfront for a period of 10 years (let’s hope the customer got a good deal for paying that far in advance) and contains various boxes, a 1931 Packard with a headless mannequin sitting on the back seat and a severed human head in a jar of formaldehyde. Obviously the ‘head in the jar’ would be a forbidden item in most storage facilities, but one has to assume that the centre manager; Mr. Yow, has been running a slack operation at Your-Self Storage. Although this scene doesn’t last for very long, it’s a classic moment in movie history set in a storage facility. Yes folks, we think the 1991 film Silence of the Lambs contains the best moment set in a self-storage facility in the movies. Not like the movies! 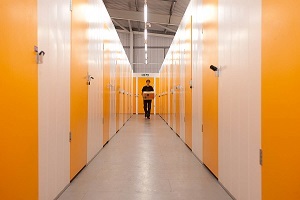 Most modern UK storage facilities are clean, dry and bright.